Christine had an art school for many years, teaching home schooled children in her area, and before that, she taught art within Parks and Recreation Departments, Senior Centers and Community Colleges. Since she has been painting prophetically, she has been invited to Christian art schools and healing centers to teach and paint prophetically as well. In the 90's, she was praying, dreaming about a place where Jesus would be glorified through the arts, when she saw an art school. "It was as though I could walk through it, so I sketched it, and the next night at church, an evangelist visiting said, "God is giving some of you visions..."
"That was many years ago, but I have held on to the promise. Lately I have been sensing an urgency to begin teaching again. Below are some samples of classes I can teach. I am also available to work with you or your specific conference to tailor make a class just for your event!" Go here to set up a class for your church or group! In this class we will learn how to do Prophetic Portraits as an outreach, in healing rooms and as an encouragement. We will do exercises to stretch us in our prophetic gifting as well as artistically. Portraits" because I had been a portrait artist for so many years. In 2006 I stepped out and did 70+ that weekend. you need eyes to see. 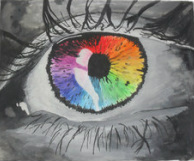 as well as eyes to see as an artist. in the prophetic as well as artistic. and is done with excellence. Drawing is to art what bones are to the body. This class will focus on drawing exercises. and fit on a 2 dimentional surface. Light holds all the colors. express light is like the icing on the cake. We will study color theory in various mediums. We will work together to help you recreate one of your visions or dreams. and put it onto canvas. You can work in your own medium or we can choose one to do as a group together!